Plastic Gospel Easter Egg containing a 9-piece jigsaw puzzle and small 'accordion-fold' booklet. The theme Bible verse is 2 Corinthians 5:17, "Anyone who belongs to Christ has become a new person." The small booklet has a joyful poem which helps children to understand and share how Jesus made all things new! Puzzle has interlocking pieces. Ideal to hand out at Christian Easter egg hunts or give out at Sunday school or Children's church. Jigsaw puzzle measures 3"X 3" (75 x 75mm) when assembled. Accordion-fold booklet measures 2-1/4" x 2-3/4" (55 x 68mm) when unfolded. 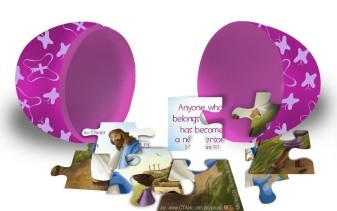 Gospel Easter Egg with Jigsaw Puzzle was published by CTA in January 2015 and is our 628th best seller. 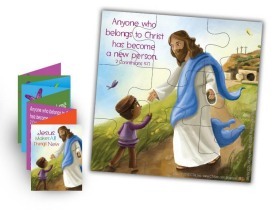 The ISBN for Gospel Easter Egg with Jigsaw Puzzle is TDJMN5EG. Be the first to review Gospel Easter Egg with Jigsaw Puzzle! Got a question? No problem! Just click here to ask us about Gospel Easter Egg with Jigsaw Puzzle.